QuickBooks can make accounting and bookkeeping for small businesses easier - when used properly. Quickbooks is one of the most efficient tax and accounting softwares on the market, but only if you know the ins and outs of the program. As Bellevue QuickBooks accountants and certified ProAdvisors, GDM Private Financial Solutions can assist with the installation, set-up, training and support of your QuickBooks system to ensure you're getting the best use of your accounting software. Setting up QuickBooks properly ensures you get the most out of your accounting software. 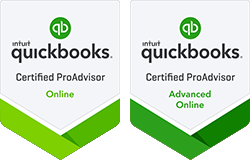 As Bellevue QuickBooks Certified ProAdvisors, GDM Private Financial Solutions can help you install software, determine which accounts to import, map accounts, create templates and more. We'll provide comprehensive training to you and your staff so you know how to use QuickBooks to its full potential and get the most out of the software. We offer on-site training so you or your in-house bookkeeper can easily handle day-to-day bookkeeping. GDM Private Financial Solutions provides ongoing guidance and bookkeeping support to answer questions and troubleshoot problems. We can assist you on a continued basis with periodic data file clean up and review services to ensure accuracy. Ready to get started? Call us at 425-283-5425 to schedule your free initial consultation.